Cipro, It just keeps on giving. . . In October 2014 I was given a 10 day course of cipro for a bladder infection. No problems. I thought. Infection gone, I celebrated my 64th birthday, life was good. Before I go too much farther, I also have type II diabetes, post polio, and several surgeries to repair injured tendons in my right ankle. I was pretty active and not always careful. Back to the saga: December 2014 after a nasty Michigan winter cold I had several corticosteroid breathing treatments to get rid of bronchitis. Wonderful Holidays. Late January - early February 2015, I am camped in my recliner with a fever, awful body aches and a burgeoning sinus infection. A call to my doctor and a prescription for a seven day course of cipro arrives from the pharmacy. Being a good patient I take the full 14 pills. On the second day, after pill 3 my Achilles tendons, both of them, start hurting. I am still feverish and achy so I pass it off as part of the infection. Only it doesn't go away and it doesn't get better. I go to my doctor, she can't explain it. I go to my orthopedic surgeon and come home with both legs in casts. He has no explanation for the seemingly spontaneous bilateral tendinitis, asks questions about what activities I've been doing that might explain it. I tell him being sick sitting in my easy chair. He doesn't believe me. A week later the tendons at the base of my left thumb become swollen and inflamed. Back to the ortho for a 3rd cast. I tell him I understand how my right ankle might be involved but I had never had any problems with my left Achilles or wrist tendons. When I got home I started looking on the internet for anything that might explain why my tendons were suddenly and spontaneously compromised. I started looking at all my medications researching what and how they did what they did. When I got to cipro it all came clear. I talked to my primary care physician, she was extremely skeptical, and actually had never heard of cipro having those kinds of side effects. I talked to my orthopedic surgeon and he wasn't familiar with cipro causing tendon problems either. But after he read the information I provided he thought it was a logical possibility but wouldn't agree that cipro was the cause, after all, he pointed out that those side effects are very rare and I had taken it before with no problems. I have had "regular" tendinitis before and it usually resolved in about 9-12 weeks. This was different, it just didn't want to go away. It was early September by the time I was cast free followed by more months of very slow physical therapy. And I thought I was done. April 2016, 18 months after original onset. We now live in semi-tropical, hot, South Texas. I lifted up my 3 year old grandson. Next day my left wrist was once again seriously inflamed. WTF! I go see my new primary care, a brilliant and well informed young resident. He finally confirms that all these tendon problems are cipro related but he says it was nearly two years ago it shouldn't still be a problem. Here's me back to the studies. While it was originally thought that tendon damage occurred as early as 2 hours after the first dose or as late as 9 months after the last dose now there were reports of onset as late as 18 months after discontinuing cipro. And there were further reports of recurrent tendinopathy months after the original onset had resolved. It took five months for my wrist to resolve. During that time my right Achilles developed spontaneous partial rupture so it was in a cast until the following January at which point a minor fall caused another partial rupture in my left Achilles tendon. That finally resolved just this last April. I spent an entire year with a cast on some part of my body. During this time I was in the hospital for a particularly resistant strain of bacteria and consulted with an infectious disease specialist who actually deals with the results of being "floxed". is permanent, recurrent and will spread. Up until this week my latest run in was the return after ten years of TMJ Disfunction that resulted in a dislocated jaw and two months with my jaws wired shut. My oral surgeon said it was clearly related to the cipro damage. Then my wrist flared up again and the PA at my old orthopedic surgeon told me that I couldn't possibly have been damaged by cipro, it was too rare an occurrence. I now have a new orthopedic surgeon. In our first appointment I described all of the problems I have had that are cipro related and he said, yes, it is real. It happened to him. He examined my wrist and put it in a cast. Life was improving until last Monday. My new urologist office called. I had a minor uti and they called in a prescription to my pharmacy to be delivered. I asked what it was and the PA said, Levaquin. I immediately told him to cancel the order and get something else. I reminded him how seriously I had been damaged and it was clearly stated in my record, no fluoroquinolones. He said he'd take care of it. A couple of hours later the delivery man shows up with my prescription and an expensive probiotic that I can't afford. I merely glanced at the pill bottle, saw to take two a day for seven days and went ahead and took the first dose. Then I looked again. I had just taken 250mg of Levaquin. It is now one week later. Today, my physical therapist palpated two partial ruptures on both of my Achilles tendons. My blood sugar has been well under control except this week it has been over 200 and I haven't been eating anything to cause it to be out of whack. So tonight I am back to the Levaquin studies and what did I learn? Levaquin will cause significant disruption in blood sugar levels for diabetics, both high and low. It is scary that no doctor or pharmacist ever told me anything about cipro side effects or a black box warning. I have made them aware of the warnings and aware of the warning last year that these drugs should be a drug of last resort simply prescribe them out of habit or because it popped up on the program as being effective. But scariest of all is the fact that I trusted that I had done everything to protect myself from this and I failed. And I am facing at least three months with both legs in casts and at least another month with the cast on my arm. And what then? Where does it show up next? Unfortunately, you have experienced a very common (unfortunately) scenario: Doctors with no clue of what they're prescribing or how it works. That's how it commonly goes. And who suffers from it? You do. 1. 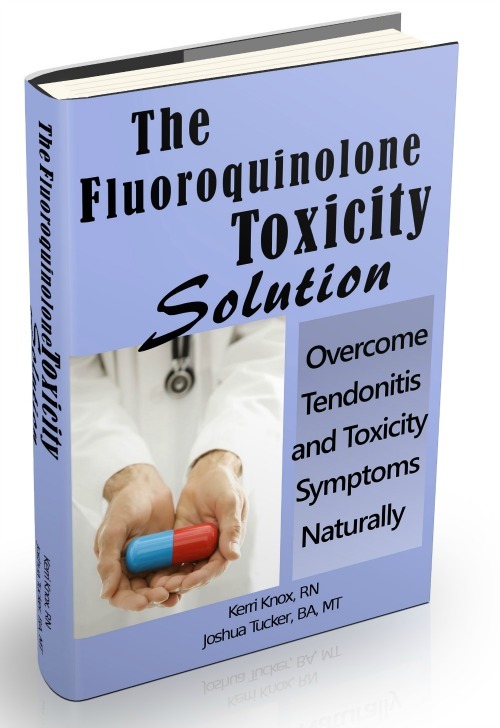 Fluoroquinolones CAN cause DNA damage, but you can have severe symptoms without any DNA damage. 2. Even if you have DNA damage, that doesn't necessarily mean that it's permanent. 3. Casting may be necessary, but it doesn't at all affect the effect that Cipro has had on your body. By which I mean, tendon damage etc is a SYMPTOM of the mechanism. The mechanism is still in play even when the Ciprofloxacin is long gone from your body. What are you doing to reverse that mechanism? Comments for Cipro, It just keeps on giving. . . Solution...My husband and I both did and we are back to normal...it took a few months, but we followed it and did everything that was suggested and we are so happy we did. We both had many side effects, involving eyes, tendons in the shoulders and upper arms, torn rotator cuff. fibromyalgia, the mystery disease..and horrible hip and knee pain..We both then were also diagnosed with low thyroid after being on these POISONS! We still have that, but other than a few digestive problems we feel fine...Not to say we don't get stiff and sore occasionally, if we over do it..But my husband is 81 now and is back to bowling, golfing, laying carpet and lots of yard work, which he hates.. So learn from the F.T.S., mentioned above and follow it strictly...But one more thing. those drugs killed both my parents and my sister-in-law, and I know many people who also are suffering or have suffered with the side effects. I have gotten most of them doing what we learned and most of them are fine now. I wish I had learned, or had the internet back when my folks and sister-in-law were put on them. So good luck and try it, and stay away from DOCTORS..they are the 3rd leading cause of death in the U.S. and prescription drugs and the 4th leading cause...That's our story! !